The SHA1C claim is that distinct messages giving collision for SHA-1 are published before January 1, 2006. SHA-1 is a cryptographic hash function defined by FIPS PUB 180-1, transforming an input message into a 160-bit output. It is designed to make it hard to find collisions, that is different messages that produce the same output. SHA-1 undeniably is the most used cryptographic hash function that is still considered secure against collisions. 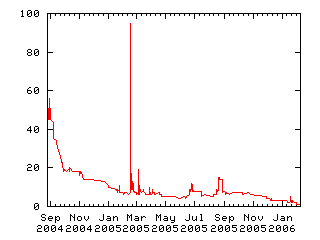 MD5 and SHA-0 collisions have been published during August 2004. The claim will be judged as True when the judge finds that messages made publicly available before January 1, 2006, are distinct and colliding. It won't be judged as False before the due date.